The available actions can be selected via the context menu that is accessed using the right mouse button or also via the ribbon. All database settings are saved in the database. It is necessary to log in to the database before editing the settings. Any user that exists in the database can be used for this purpose. You can always restore Global settings via the ribbon. This area can be used to configure which services will be used for multi-factor authentication. The available services are: RSA Secure ID, SafeNet, YubiKey NEO, and YubiKey Nano. After selecting the required service, specify the respective access data. You must also configure various services. In this case, you can specify on the client which methods will be used by the individual users. Further information on this subject can be found in the section Multifactor authentication. Via the PKCS # 11 interface, the server keys can be protected via a hardware security module (HSM). The interface can be configured here. If desired, the logbook, notifications, session recordings and also the historical documents can be automatically cleaned up here. You merely have to enter how old the data needs to be before it is deleted. Logbook entries can be exported before the deletion process. !It is important to note that the logbook is also used for the filter functions. If the logbook is regularly cleaned up, it is possible that the full functions of the filter will no longer be available. Expiry of the lock. The user can be unlocked by right-clicking on an entry. A user can be locked manually using the corresponding button. It is necessary to select the user, configure the expiration of the lock and specify a reason. You can use the corresponding button to display all currently connected clients. After selecting a session, the connection can be disconnected. Once a database has been selected, the “Migration”:https://help.passwordsafe.de/v8/1/en/topic/migration can be started via the ribbon. This also allows multiple version 7 databases to be merged into one. !When the migration is started, the database is set to migration mode. For the duration of the migration, it is not possible to log in to the database – users who are already logged in will be sent a corresponding message. The sessions will, however, remain open so that users can continue working as soon as the migration is complete. Management of the certificates is very important. This is described in the section certificates. This button can be used to call up statistics about the users in the respective databases. It shows you which users are active in which database. Naturally, this list can also be exported. Here you can view the history of all backups or also a single backup. 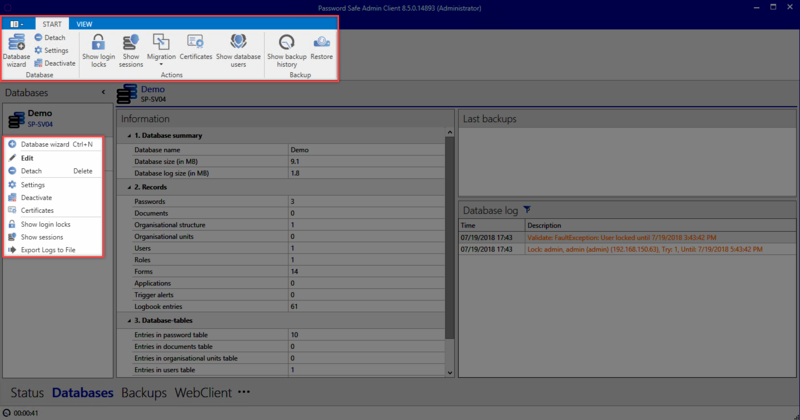 All backups of the database are displayed hierarchically in a sortable list.